Integrating technology into content, instruction, and assessment can be complex and challenging. As a result, teachers are developing a new form of literacy-a collection of skills, competencies and knowledge that involves more than a single set of knowledge and skills. 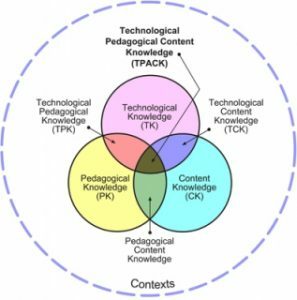 It is necessary to teach technology within the contexts of what you are teaching (the content) and how you teach (the pedagogy). Knowledge about the subject matter, such as Literacy, Math, or Science. This new literacy involves re-purposing technology tools for our needs, as most technology tools were not designed for educational purposes.